Because burger joints are dime-a-dozen and can be found everywhere from dusty street corners to air-conditioned malls, we asked John Marvin Aldover, a.k.a. Chef Joms of Batangas City, what makes his burgers different from others. He does not know, Chef Joms replied with refreshing candour. “What I know,” he added, “is that I have full confidence in the food that I serve to my customers. 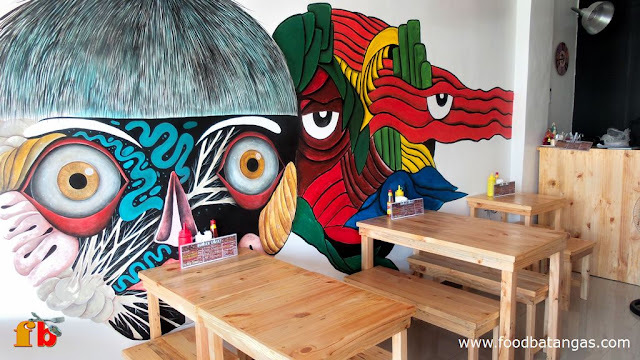 Food Batangas caught up with Chef Joms at Burger Street Lipa, opened as recently as the 16th of September along the suddenly busy economic hub that is barangay Paninsingin and right in front of De La Salle Lipa’s new College of Business building. The new restaurant was opened in partnership with former DLSL basketball varsity player John Patrick Oñate and the second owned by Chef Joms. Chef Joms (left) and partner John Patrick Oñate. 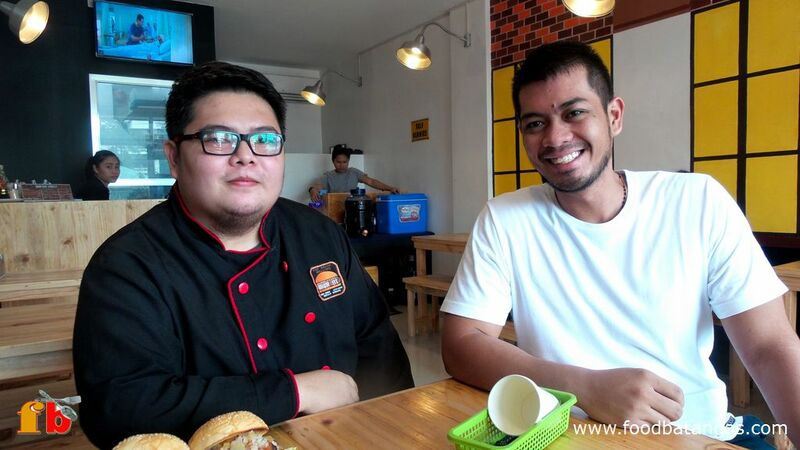 Formerly Head Chef at Uncle Cheffy’s Restaurant in Lipa, Chef Joms was among the pioneers of the garage burger industry that has been en vogue for a while now in Batangas City. 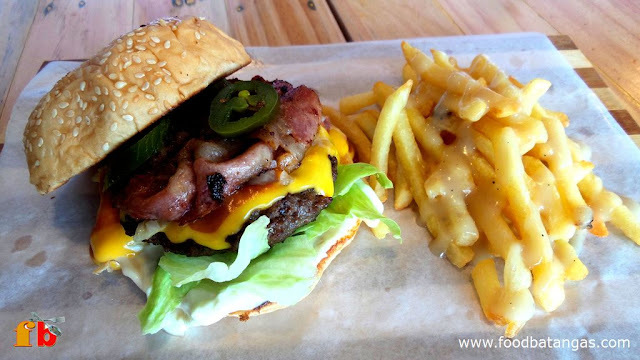 Behind this industry have been culinary arts practitioners who have been selling gourmet burgers in their own homes. The name Burger Street, Chef Joms told us, was inspired by the fact that he literally had to sell burgers on the street in front of his home when he first started operations in July 2014. This was how the garage industry basically started; and sales were driven by word-of-mouth advertising by satisfied customers. A year later and Chef Joms was able to open a restaurant in Alangilan, Batangas City. Operations at the Alangilan restaurant are bigger than those in Lipa, where the menu is limited to burgers, hotdogs and sausages. How the new restaurant came to be was a story in itself. Chef Joms was asked by a prospective partner to prepare menus and recipes for a restaurant project. The project was suddenly cancelled, leaving him with menus and recipes he initially did not know what to do with. But Chef Joms is nothing if not a passionate man; and took a leap of faith in opening a restaurant by himself. This passion is evident in the food offerings available at Burger Street; and may be the defining advantage Chef Joms says he does not know he has over competitors. The menu is thematically and unashamedly contemporary American; but even the ubiquitous burger is given a new lease on life not only with raw passion but also with plenty of imagination and culinary savvy. The Chef's Choice burger has a subtle bite. We tried the Chef’s Choice, a Mexican-inspired burger with slices of japapeños and pico de gallo along with homemade bacon, cheese and chilli meat sauces and dressing. The burger is simple, elegant and packs a subtle bite as only the jalapeño can give; perfect, in other words, for diners who like a bit of flame in their mouths when they eat. The other burger, called the Surf and Jurf, was the sheer embodiment of imagination. Tempura and calamari along with the sauces and picol de gallo blended seamlessly with the beef patty to create a burst of flavours inside the palate. Both burgers are to die for; and served with fries and ice tea, each will seem like a steal at PHP 250. Contemporary decor and furniture for American-inspired cuisine. For the more budget conscious, the Classic Grilled Burger goes for only PHP 120, already served with fries and iced tea as are all other burgers. 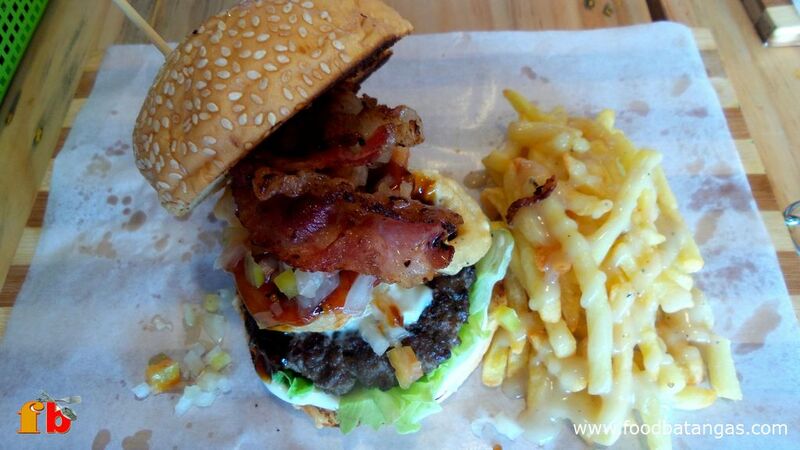 For those with long intestines, the Brgr Tower is available at PHP 300. Those not into burgers may also wish to try the Texas Chilidog (PHP 150), Cheese Dog (PHP 120) or Smoked Sausage (PHP 200). Steaks are currently still not available in Lipa but are already being served in the Alangilan restaurant. 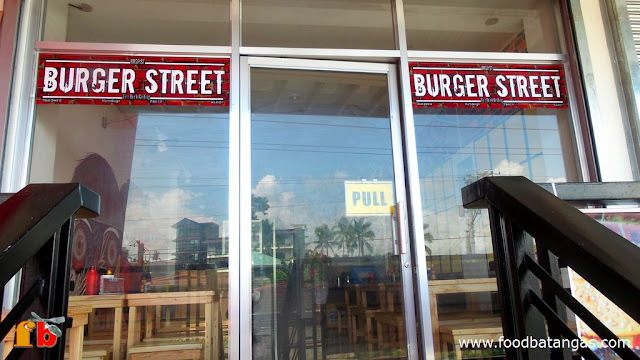 For those who wish to try out Burger Street, the Batangas City restaurant is in front of the Nissan Show Room in Alangilan. 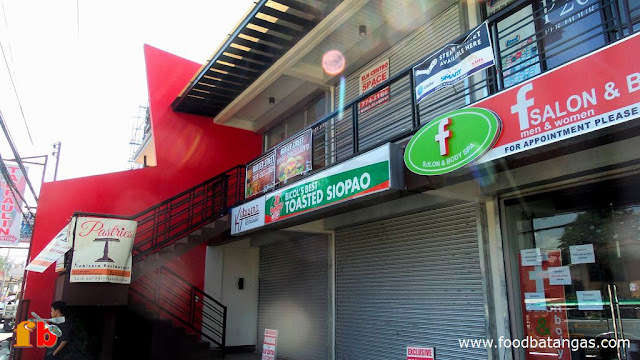 The Lipa restaurant, on the other hand, is at the second floor of the new ELN Building along Barangay Paninsingin in front of the DLSL College of Business Building. Burger Street Lipa is at the second floor of the ELN Building. The ELN Building in Paninsingin, Lipa City as seen from the road.